Since our first class in 2011, ArtsCalibre Academy’s K- 9 program has grown a destination of choice for the Capital Region families. Students enrolled in ArtsCalibre’s Elementary programs are encouraged to approach inquiry with unbridled curiosity, think unconventionally, question the norm and imagine and reflect upon new perspectives in order to build upon their creative capacities. The collective power of this learning environment fosters the development of passionate and thoughtful members of both the local and global community. At the heart of ArtsCalibre’s core curriculum lies the ability to accommodate the student’s natural curiosity. In using experiential, theme-based activities we are able to deliver outstanding education and instruction across all subjects. Language Arts: Developing strong reading, comprehension, writing and speaking skills through books, poems, music, dance and imaginative play. Mathematics: Fostering numeracy skills through reading, music and rhythm, cooking, etc. Social Studies:Teaching history, geography and various cultures through literature, music, dance, theatre and visual arts. 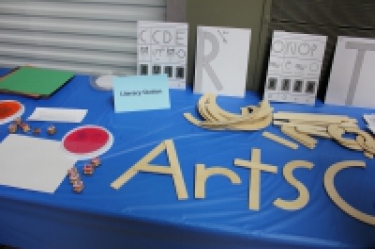 Science: Reinforcing science and supplementing traditional instruction methods through creative means such as role playing, manufacturing instruments, etc. Health and Wellness: Promoting a healthy lifestyle through outdoor education, dance, body awareness and culinary arts. Physical Education: Promoting fitness through traditional sports as well as culturally diverse disciplines such as outdoor education, dance, swimming, Yoga, Pilates etc. French: Developing vocabulary and an understanding of culture through reading, speech, song and the study of visual and other art forms. We suggest half day kindergarten for children who need more time to transition into school. There is a considerable amount of literature on half day vs. full day kindergarten; the Canadian Council on Learning issued the following report on the matter. Ultimately, it is whatever works best for you and your child that is most important. We believe in meeting students where they are at, not where a standardized test says they should be at. We are happy to discuss your child’s needs when deciding on half or full day kindergarten. Our programs run from September through June each year, and closely follow the Greater Victoria School District calendar and holiday schedule. However, unless otherwise specified on our School Calendar, ArtsCalibre is OPEN on the “non-instructional” (Professional Development) days scheduled by the District. Please see our calendar for a more details. We suggest families book a tour or attend an upcoming open house before proceeding with registration, as the registration fee is non-refundable. To book a tour, click here. For information on upcoming Open Houses, click here. To register, click here.